Creatine and Creatine Phosphate: Scientific and Clinical Perspectives is an up-to-date summary of both the scientific and medical aspects of creatine and creatine phosphate metabolism and therapy. It covers in detail the basic biochemistry, bioenergetics and biophysics of these agents with particular emphasis on their role on the cardiovascular and muscle systems. Modern in vivo myocardial and skeletal muscle measurements are outlined, and the importance of the molecules in cardiovascular medicine, sport science and cardiac surgery are highlighted. This book is designed for those interested in the basic scientific background to creatine and creatine phosphate, and also for physicians treating or studying heart and vascular disease. The book will also be vital for sports scientists who wish to acquire a comprehensive knowledge of the molecule which is currently being promoted for performance and exercise programmes. List of Contributors. A Brief Review of the Sections. Preface. Acknowledgements. Basic Biochemistry of Creatine and Creatine Phosphate: Old and New Ideas on the Roles of Phoshagens and their Kinases, E.A. Newsholme and I. Beis. Creatine Phosphate Shuttle Pathway in Tissues with Dynamic Energy Demand, T.S. Ma, D.L. Friedman, and R. Roberts. Experimental Observations of Creatine and Creatine Phosphate Metabolism, J.F. Clark, J. Odoom, I. Tracey, J. Dunn, E.A. Boehm, G. Paternostro, and G.K. Radda. An Introduction to the Cellular Creatine Kinase System in Contractile Tissue, J.F. Clark, M.L. Field, and R.Ventura-Clapier. Cardiac Energetics: Compartmentation of Creatine Kinase and Regulation of Oxidative Phosphorylation, V.A. Saks. The Role of the Creatine Kinase/Creatine Phosphate System Studied by Molecular Biology, J.F. Clark. 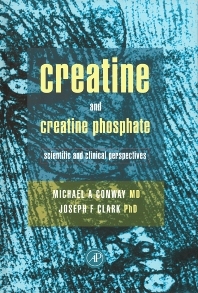 Biochemical Basis for a Therapeutic Role of Creatine and Creatine Phosphate. Molecular and Cellular Mechanisms of Action for the Cardioprotective and Therapeutic Role of Creatine Phosphate, V.A. Saks, Valery Stepanov, I.V. Jaliashvili, E.A. Konorev, S.A. Kryzkanovsky, and E. Strumia. Effects of Creatine Phosphate on Cultured Cardiac Cells, T.J. Lampidis, Y.-F. Shi, and L. Silvestro. Magnetic Resonance Spectroscopy of Creatine Phosphate in the Cardiovascular System: Creatine Phosphate: in vivo Human Cardiac Metabolism Studied by Magnetic Resonance Spectroscopy, M.A. Conway, R. Ouwerkerk, B. Rajagopalan, and G.K. Radda. Skeletal Muscle Metabolism in Heart Failure, M.A. Conway, B. Rajagopalan, and G.K. Radda. Therapeutic Aspects of Creatine and Creatine Phosphate Metabolism: Clinical Experience with Creatine Phosphate Therapy, P. Pauletto and E. Strumia. Creatine Phosphate Added to St. Thomas' Cardioplegia, D.J. Chambers. Uses of Creatine Phosphate and Creatine Supplementation for the Athlete, J.F. Clark. Creatine and Creatine Phosphate: Future Perspectives, M.A. Conway and J.F. Clark. Appendix: Assay for Creatine and Creatine Phosphate. Glossary. Index. Stim-Lab Division of Core Lab, Inc., Duncan OK 73533, U.S.A.
Resonance Spectroscopy Unit, University of Oxford, U.K.